Spambrella is more effective than Office 365 security in blocking spam, viruses and malicious content (attachments, weblinks) etc.—In every customer trial, over 4 weeks, Spambrella consistently blocks hundreds of malicious emails that were not detected by native Office 365 security. Spambrella protects customers against business fraud propagated via impostor emails. This is a serious emerging threat that is impacting businesses of all sizes (costing businesses $5.3 Billion collectively). The average attack costs organizations $67,000. Office 365 does not offer any protection against these types of attacks. The Spambrella Professional package coupled with Office 365 E1 package is 65% to 160% cheaper than Office 365 E3/ E5 packages—and thus offers superior protection at a lower cost. Spambrella is deployed easily and works seamlessly with O365. It further protects customers against any outages in O365 with a 30-day email continuity feature. In addition to protecting your emails, Spambrella also protects your social media assets such as Facebook, LinkedIn pages, Twitter accounts etc. Office 365 represents Microsoft’s cloud-based email and collaboration platform. 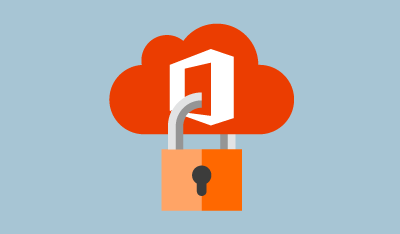 Many Office 365 customers have found themselves requiring more advanced security capabilities than are available natively with Office 365. Small to mid-sized enterprises are easier targets for cyber criminals because they are generally protected by less sophisticated software or they are not protected at all. Unfortunately email attackers have worked this out and now realize that targeting a smaller enterprise can actually mean a bigger reward in the end. Spambrella offers key differentiators that complement Office 365 security, such as protection against advanced threats including business fraud via impostor emails, ransomware attacks. Spambrella also automatically detects and secures (block / alert / encrypt) sensitive information leaving the organization. In addition to protecting your email, Spambrella also protects your social media assets such as Facebook, LinkedIn pages, Twitter accounts etc. This enables organizations of all sizes to take full advantage of the benefits of Office 365 without sacrificing the key security requirements. Over a month period, we were able to catch 250+ malicious attachments and 150+ URLs that were missed by Office 365 for a retail organization. Over a 30-day period, Spambrella detected more than 300+ malicious messages for a financial services institution that passed through their Office 365 security solution. Over a two-week period, 39% of messages deemed “clean” by Office 365 were identified as Malware, Phish, Spam, or Bulk by Spambrella. Over a month period, Spambrella was able to catch 80+ malicious messages that were missed by Office 365 security. Staffing Services: Over a two-week period, Spambrella caught over 450 phishing messages that bypassed Office 365. Spambrella’s Professional package provides superior protection at 65% to 165% lower cost than Office365 E3/E5 packages. 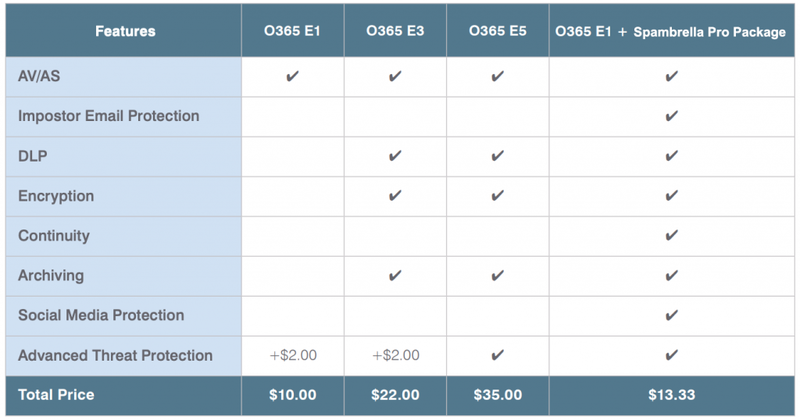 The table below shows the features included and monthly price for each of the O365 packages. Spambrella Professional package can be purchased with Office 365 E1 to maximize cost savings and feature set. Easy Plug-and-Play: Spambrella works seamlessly with Microsoft Office 365. Getting set up on Spambrella for Office 365 is a simple and intuitive process. Spambrella is deployed between the Office 365 environment and the Internet. Inbound mail is routed to Spambrella by changing your MX records. After email is processed by Spambrella it is then routed to Office 365. Since Spambrella sits in front of Office 365, the Spambrella Emergency Inbox is activated instantly and automatically when it detects an Office 365 email service outage, enabling your users to access email (i.e. open, reply, compose, etc.) for business as usual. Outbound email is routed to Spambrella before going to the internet. What’s more, we have a dedicated support team to help you through the whole process of strengthening security for your Office 365 users easy and hassle-free, just as it should be. To view Spambrella service packages – Click here.